If I can manage my income, I can control my tax liability and potentially save thousands of dollars in taxes — by rightfully claiming tax deductions and credits. Though my husband and I work with a CPA to file our tax returns, I've learned that knowing certain income limits myself can mean more cash in my pocket. More specifically, if my husband is covered by a workplace retirement plan, then I may not be able to deduct contributions to a traditional IRA. If our combined income is too high one year, then we're not eligible to put money inside a Roth IRA or get certain tax credits associated with our son's college expenses. Some restrictions make sense to me. For example, a high earner shouldn't be eligible to receive a tax credit that's designed to reward retirement saving among low-to-moderate income workers. But others don't seem intuitive or logical. For example, high-income families can't contribute to a Coverdell but can add funds to a 529 Plan account for college savings. Whether or not income eligibility rules sync with my way of thinking, they exist. Knowing the rules can help me control my tax liability. Potentially, I can snag a tax credit or deduction by taking certain actions. These may include giving to my favorite charity, ditching poorly performing investments at a loss, or contributing to a traditional 401(k) rather than a Roth 401(k). I don't want to be controlled by tax rules. But I like being aware of the regulations so I can make informed decisions. So, I'm looking at these restrictions to keep them top of mind. I can contribute to a Traditional IRA regardless of my income level and whether or not my husband or I are covered by a workplace retirement plan. However, we may not be able to deduct these contributions if our income and retirement plan status don't meet certain requirements. 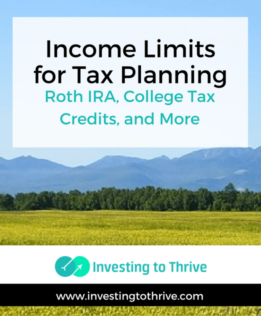 The good news is that there are no income limits for deducting IRA contributions if my spouse and I aren't covered by a workplace retirement plan. Single or head of household and covered by a workplace retirement plan: full deduction if income is $62,000 or less; partial deduction, if more than $62,000 but less than $72,000; no deduction, if $72,000 or more. Married couples filing jointly and I'm covered by a workplace plan: full deduction if income is $99,000 or less; partial deduction, if more than $99,000 but less than $119,000; no deduction, if $119,000 or more. Married couples filing jointly, if I'm not covered but my spouse is covered: full deduction if income is $186,000 or less; partial deduction, if more than $186,000 but less than $196,000; no deduction, if more than $196,000. Married, filing separately if my spouse is covered by a workplace retirement plan: no full deduction available at any income; partial deduction if income is less than $10,000; no deduction, if $10,000 or more. Single or head of household and covered by a workplace retirement plan: full deduction if income is $63,000 or less; partial deduction, if more than $63,000 but less than $73,000; no deduction, if $73,000 or more. Married couples filing jointly and I'm covered by a workplace plan: full deduction if income is $101,000 or less; partial deduction, if more than $101,000 but less than $121,000; no deduction, if $121,000 or more. Married couples filing jointly, if I'm not covered but my spouse is covered: full deduction if income is $189,000 or less; partial deduction, if more than $189,000 but less than $199,000; no deduction, if more than $199,000. I can contribute to a Roth IRA if my MAGI falls below a certain threshold. Unlike a traditional IRA, eligibility is based on income — not the availability of a workplace retirement plan. If my husband and I have income that's too high, we aren't eligible to make Roth IRA contributions. This restriction is one reason financial experts encourage young people to contribute to a Roth IRA; when we get older, we are likely to earn more and become ineligible to make contributions. Single and head of household: full contribution if income is less than $118,000; partial contribution, if more than $118,000 but less than $133,000; no contribution, if $133,000 or more. Married couples filing jointly: full contribution if income is less than $186,000; partial contribution, if more than $186,000 but less than $196,000; no contribution, if $196,000 or more. Married individual filing separately (if lived together): partial contribution if income is less than $10,000; no contribution, if $10,000 or more. Single and head of household: full contribution if income is less than $120,000; partial contribution, if more than $120,000 but less than $135,000; no contribution, if $135,000 or more. Married couples filing jointly: full contribution if income is less than $189,000; partial contribution, if more than $189,000 but less than $199,000; no contribution, if $199,000 or more. A saver's credit valued at up to $1,000 ($2,000 if married) is available to taxpayers who have adjusted gross income (AGI) ranging from $31,000 to $62,000 or less and meet other requirements. Calculations are based on filing status, income level, and retirement plan contributions (workplace or IRA). For starters, you must be 18 years or older, not a full-time student, and not claimed as a dependent on another person's tax return. Married filing jointly: 50% of contribution if income is $37,000 or less; 20%, if between $37,001 and $40,000; 10%, if between $40,001 and $62,000; no credit, if more than $62,000. Head of households: 50% of contribution if income is $27,750 or less; 20%, if between $27,751 and $30,000; 10%, between $30,001 and $46,500; no credit, if more than $46,500. Other filers – single, married filing separately, or qualifying widow(er): 50% of contribution if income is $18,500 or less; 20%, if between $18,501 and $20,000; 10%, between $20,001 and $31,000; no credit, if more than $31,000. Married filing jointly: 50% of contribution if income is $38,000 or less; 20%, if between $38,001 and $41,000; 10%, if between $41,001 and $63,000; no credit, if more than $63,000. Head of households: 50% of contribution if income is $28,500 or less; 20%, if between $28,501 and $30,750; 10%, between $30,751 and $47,250; no credit, if more than $47,250. Other filers – single, married filing separately, or qualifying widow(er): 50% of contribution if income is $19,000 or less; 20%, if between $19,001 and $20,500; 10%, between $20,501 and $31,500; no credit, if more than $31,500. There are some education-related tax breaks available to to individuals and families who meet certain requirements and fall under income limits. The rules are nuanced but the benefits seem valuable for tuition-paying taxpayers — worth $10,000 or more over four years of college. Married filing jointly: full credit, if income is $160,000 or less; partial credit, if over $160,000 but less than $180,000; no credit, if $180,000 or more. Other filers: full credit, if income is $80,000 or less; partial credit, if over $80,000 but less than $90,000; no credit, if over $90,000. Married filing jointly: full credit, if income is $111,000 or less; partial credit, if over $111,000 but less than $131,000; no credit, if $131,000 or more. Other filers: full credit, if income is $55,000 or less; partial credit if income is over $55,000 but less than $65,000; no credit, if $65,000 or more. In the past, we could reduce our taxable income by claiming a deduction for qualified education expenses (specifically college tuition and fees) paid on behalf of our sons. However, this deduction is no longer available unless tax laws change. Note that the income limits are the most current I could find on the IRS website. In addition, certain credits and deductions can't be combined. I've never claimed the earned income credit, but it looks worthwhile to pursue for those with incomes of $53,930 or less. Having qualifying children boosts the income limits, which start at $15,010. To claim this credit, I can't have investment income of more than $3,450. So if I happened to be living on a moderate income supplemented by proceeds from the sales of investments (with capital gains), then I couldn't get this tax credit. It's meant to provide incentives for working individuals and families with limited outside resources. Single, head of household or widowed: $15,010, no children; $39,617, one child; $45,007, two children; $48,340, three or more children. Married filing jointly: $20,600, no children; $45,207, one child; $50,597, two children; $53,930, three or more children. Single, head of household or widowed: $15,310, no children; $40,402, one child; $45,898, two children; $49,298, three or more children. Married filing jointly: $21,000, no children; $46,012, one child; $51,598, two children; $54,998, three or more children. In addition to the credits mentioned here, taxpayers may also be eligible for favorable capital gains taxes and healthcare insurance premium subsidies — when certain conditions are met and income is below a certain level. Child and dependent care tax credits are available at any income level. But the lower your income, the more you can claim as a tax credit percentage-wise. contributions to healthcare accounts, such as a Health Savings Account (HSA) or a Flexible Spending Account (FSA). To reduce AGI and tax liability, I might make a retirement plan contribution, refrain from selling stock that generates capital gains, or make a charitable gift to increase my itemized deductions. When I started saving for retirement, any taxpayer with earned income could contribute to an IRA and get a tax deduction, regardless of income level. Today's tax law is more complex. There are income limits and eligibility restrictions for deductions, contributions, tax credits, and more. I've learned that paying attention to the limits can sometimes reduce my tax bill. Have you noticed income limits and made moves to lower your income? What did you do?